The Lord Loveth A Cheerful Giver, this Norman Rockwell painting, appeared on the cover of Life Magazine published November 8, 1917. An alternate title for this picture is Mother with Two Sons in Service. This was the third cover by Rockwell to appear on Life Magazine. 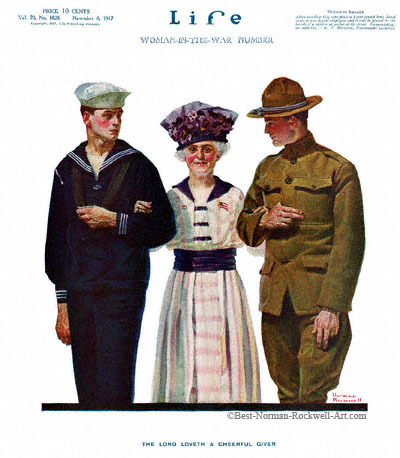 A Rockwell illustration appeared on the Life magazine cover four times in 1917 and twenty-eight times in all. The first Norman Rockwell Life cover, T'aint You was published on May 10, 1917 and the last cover,Girl Scouts Number on November 6 1924. This illustration is reproduced on page 38 of Norman Rockwell, A Definitive Catalogue by Laurie Norton Moffatt.